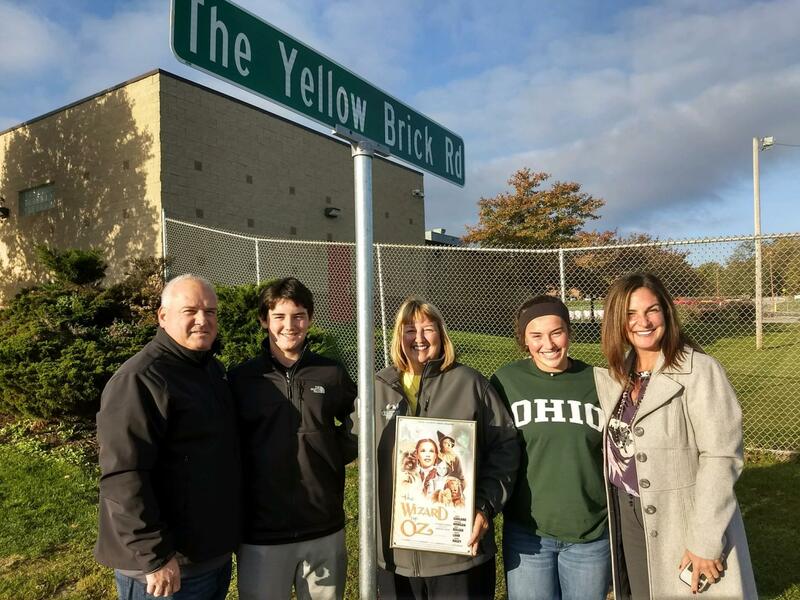 As part of the BBHCSD’s partnership with the Brecksville-Broadview Heights Schools Foundation, the third and final street name for this year was dedicated earlier this week and officially renamed “Yellow Brick Road.” Sponsored by the Stease Family, “Yellow Brick Road” was selected as its new name for the next year, reflecting Denise Stease’s affinity for the story The Wizard of Oz. In bidding for this street name, the BBH Schools Foundation received a donation as part of its ongoing fundraising campaign. For a donation to the organization during an auction event earlier this year, members from the community were able to bid for the rights to the name one of three street signs on the High School, Middle School and Board Office campus. The Stease family won the bidding for this particular street sign. The Stease family includes current BBHCSD students, Mackenzie (Class of ’19) and Corey, (Class of ’21) and recent graduate Connor (Class of ’13). Congratulations to the Stease Family for having one of our street signs renamed in honor of this timeless story and thank you for your participation in this fundraising campaign.